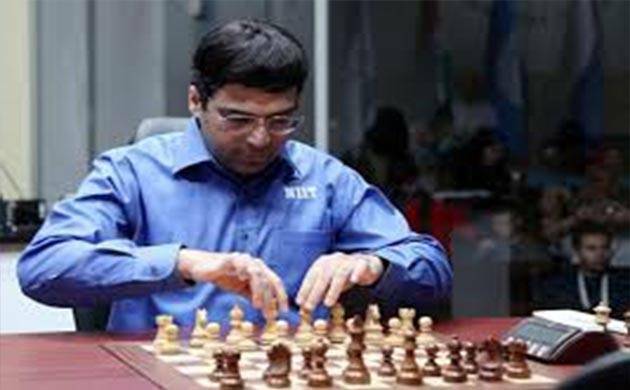 Viswanathan Anand was held onto his fourth draw in five games and slipped to joint second position after the conclusion of the fifth round of Sinquefield Cup, a part of the Grand Chess Tour, now underway here. Playing white against Wesley So, Anand encountered a new idea that was known to him but the Filipino turned American had done some excellent homework. The draw cost Anand his joint first place but the Indian ace is well-placed in the last four rounds. Veselin Topalov of Bulgaria finally put an end to the draw-streak that did not see one decisive games in the last two rounds. On the receiving end was China's Ding Liren who found to his astonishment, his king trapped for checkmate in the end game. Topalov nosed ahead of the field with his second victory in the tournament and moved to 3.5 points out of a possible four. As this was the lone decisive game of the day, Anand, Wesley So and Levon Aronian of Armenia remained on the heels of the leader a half point behind. American duo of Fabiano Caruana and Hikaru Nakamura share the fifth spot on 2.5 points a piece, a half point ahead of Ding Liren, Maxime Vachier-Lagrave of France and Anish Giri of Holland. Russian Peter Svidler is at the last spot on 1.5points in the USD 300,000 prize money tournament. In the other games of the day, Vachier-Lagrave survived some difficult moments before he used Caruana's time trouble to steer to safety while Anish Giri split the point with Aronian. Hikaru Nakamura also had his third draw in the event, signing peace with Svidler. Anand employed the Italian opening that has been finding favours from the Indian off late and found Wesley finely prepared to counter the same. The American sacrificed a pawn early in the opening to get active piece-play and was without a worry when Anand liquidated to a level endgame. "I'm very glad to be able to compete with Vishy in the opening," So said. "He has some of the deepest openings as you can see from his matches." Praising his opponent for the pawn sacrifice, Anand said, "It's a very good try," "You get something close to a Marshall Gambit. It's a pawn, but it's a fraction of a pawn." Speaking about his chances in the tournament Anand was practical, "Clearly I am well positioned. Having said that its too early to think along those lines," he said. Results round 5: V Anand (Ind, 3) drew with Wesley So (Usa, 3); Peter Svidler (Rus, 1.5) drew with Hikaru Nakamura(Usa, 2.5); Veselin Topalov (Bul, 3.5) beat Ding Liren (Chn,2); Fabiano Caruana (Usa, 2.5) drew with Maxime Vachier-Lagrave (Fra, 2) Anish Giri (Ned, 2); drew with Levon Aronian (Arm, 3).